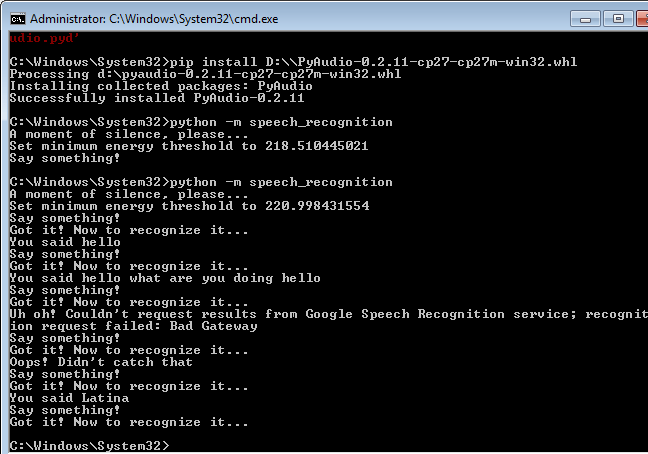 Speech Recognition is always a difficult and interesting task to do for a lot of beginners. In this post, we are going to describe an easy way to do this tuff task using PocketSphinx. Also, there are more options available in the package other than CMU Sphinx (works offline). If you want to use command line then you may install the pre-requisite first using the following command explained in this file. If you are using Mac book then you may use brew to install this. Or you can follow instructions on official PyAudio Website. If you are in Windows and you found some error like this. some other similar, then you may need to close your Python IDE or any other python code running in the background. These kinds of errors are explained in this StackOverflow question.